Hybrid knapweed is a cross of diffuse knapweed and spotted knapweed and it is not clear whether hybridization occurred before or after its introduction to North America. Similar to its parent species, it can invade grasslands and displace important forage species for livestock and wildlife. The flowers are often pinkish-white and 6-15cm wide. The bracts (modified leaves, with a flower in the centre) usually have short straight spines and often the vertical stripes typical of spotted knapweed. Leaves have hairs, are deeply lobed and are grey-green in colour. Hybrid knapweed grows up to 150cm tall. 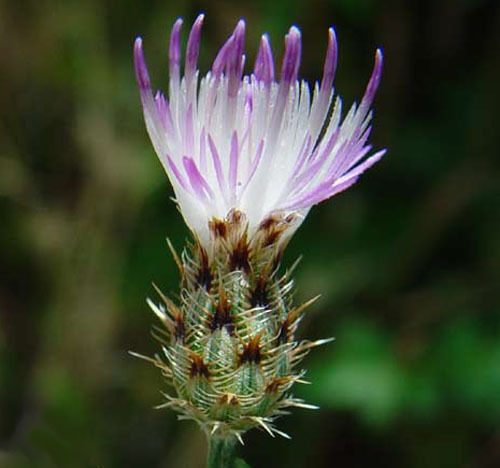 Hybrid knapweed shares characteristics of both parent species. Hybrids are highly variable in appearance therefore, several characteristics need to be considered for a clear identification.